Careers at Silixa| Silixa Ltd. If you are looking for a new and challenging role within a dynamic team email us at UKJobs@silixa.com for jobs in the UK and at USJobs@silixa.com for jobs in the USA. Silixa Ltd promotes equal opportunity in employment. Please be aware that, although we try to respond to all applications, if you have not received a response within 28 days then unfortunately you have been unsuccessful on this occasion. 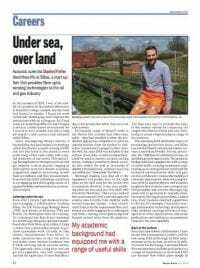 Read a feature article in Physics World on what it’s like to work at Silixa – click here to download. We are looking for an energetic and dedicated individual with fibre optic experience in the energy industry (petroleum, renewable, electrical power). The candidate should have the ability to work on their own initiative while also contributing to team-oriented projects. The position will require the candidate to be versatile, flexible, hands-on, and a self-starter. The candidate must possess the self-confidence to challenge actions that may compromise the performance of Silixa’s technology. As the role will require the candidate to undertake a range of industry HSE training & certification before they can be deployed to the field, they must fulfil the medical requirements required to obtain the required certifications. Ideally the candidate will have a relevant engineering or similar technical qualification. However, candidates with extensive field installation experience will be also considered. Due to the nature of the business we will require the candidate to be in a position to obtain medical certificates for a variety of job locations, including offshore. Any job offer will be dependent upon the candidate undertaking an appropriate medical at Silixa’s expense to ensure their ability to undertake this role. An attractive and competitive package is being offered. This will include private medical insurance, group life assurance and an attractive pension plan. Informal enquiries may be addressed to Roxanne Trainor at 020 8327 4210. Reporting to a senior member of the technical team, the successful candidate will expand their skills and experience through working on Silixa’s world leading range of optical fibre sensors. The successful candidate will be expected to grow into a lead role in the test, characterisation and optimisation of new sensing systems, and their embedded optoelectronics modules. Included in this role is the development of new test rigs to characterise and so expand the performance of Silixa’s next generation of sensors. It is expected that the successful candidate would also lead the development of new optoelectronics assemblies which integrate into Silixa’s optoelectronics interrogators. This role will be largely hands-on but will include data analysis and technical writing for both internal and external reports. The successful candidate will also have the opportunity to support projects across different departments, which will offer an interesting insight into the various activities at Silixa. Through this role, the successful candidate will gain expertise in Silixa’s optoelectronics systems which could lead to opportunities to support Silixa’s worldwide field operations. This is an exciting opportunity for the successful candidate to join a highly innovative and expanding company with a view to bringing world leading products from design into production. We are looking for a technically strong individual with relevant experience in the area of optoelectronics, and preferably with optical fibre systems. The candidate should have the determination and diligence to complete a task to its full, even if under high pressure situations. Adhering to Company’s and clients’ HSE requirements and local legislation at all times and actively promote safe work practices. We are looking for a motivated and dedicated individual with relevant experience in electronics/optoelectronics manufacturing environment.